I have come to realize something about myself. I love almond flavoring! I only came to this realization recently, after eating these green tea and almond cupcakes from Baked , but, from now on, I am all about eating anything flavored with almond! Actually, this new found epiphany is not really surprising, given the fact that I eat almonds every day, but as much as I love real live almonds, I don’t know if they can take credit for the yumminess of these cupcakes. I think it’s the more intense almond extract that does the trick. Whatever it is, I think these may be the best cupcakes I’ve ever made! They were definitely a nice change over more traditional chocolate/vanilla cupcakes. Oh, and the green tea taste is very subtle, so if you’re not a tea lover, I wouldn’t let that stop you from trying these! So good! You can find the complete recipe after the jump. Make the almond cupcakes: Preheat the oven to 325 degrees F. Line two 12-cup cupcake pans with paper liners. In the bowl of a food processor, pulse the almonds until they are a find powder. Put the powdered almonds in a small bowl and set aside. Sift the flours, baking powder, baking soda, and salt together in to a large bowl and set aside. Fill the cupcake liners about three quarters full. Bake for 20 to 25 minutes, rotating the pans halfway through the baking time, until a toothpick inserted in the center of a cupcake comes out clean. Transfer the pans to a wire rack and let cool for 20 minutes. Remove the cupcakes from the pan and place them on the rack to cool completely. 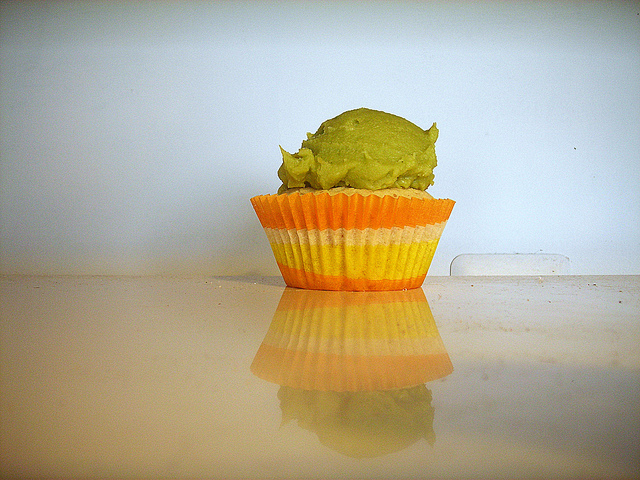 Make the green tea Frosting: In a medium heavy-bottomed saucepan, whisk the sugar, flour, and matcha powder together. Add the milk and cream and cook over medium heat, whisking occasionally, until the mixture comes to a boil and has thickened, about 20 minutes. Add the vanilla and continue beating until combined. If the frosting is too soft, put it in the refrigerator to chill slightly, then mix it again until it is the proper consistency. If the frosting is too firm, set the bowl over a pot of simmering water and mix again. Assemble the cupcakes: There are many ways to frost a cupcake. If you have a pastry bag, simply fit the bag with the largest tip, fill the bag with frosting, and pipe enough frosting to cover the cupcake. If you do not have a pastry bag, use an ice cream scoop with a release mechanism to scoop the frosting and dispense it onto the top of the cupcake. You can also use an offset spatula to frost the cupcakes. Man, I don't know how I passed over that recipe in that book, because I adore anything almond and love green tea, too. Plus, every Baked recipe I've made so far has been a winner. Must try these. For sure! I love green tea cakes! Thank you for the recipe! Good post, i've actually tried doing this before but couldn't seem to get the texture of the frosting right. 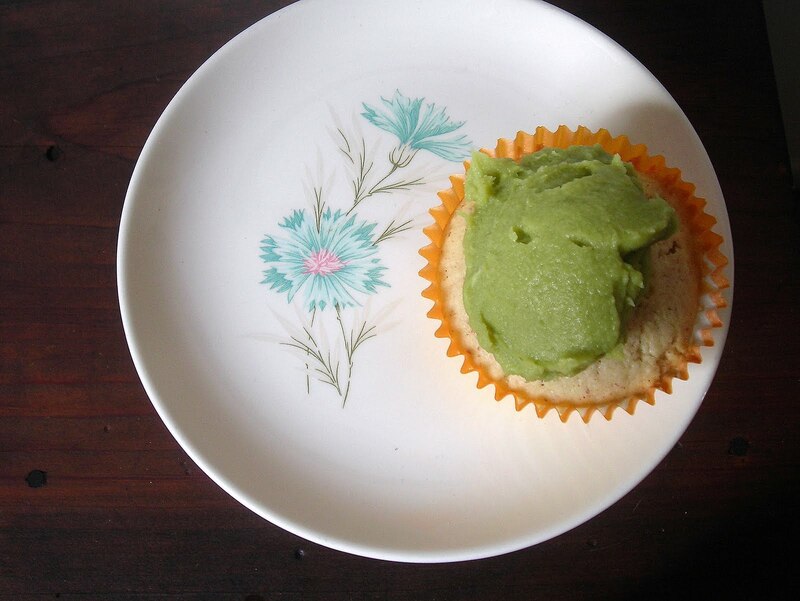 I haven't tried green tea cupcakes yet but i loveeeee green tea. I don't think i can live without my evening cup of tea...lol. So, I am sure i would love these delightful cuppies! I love that plate! I've used it at least a couple times on this site.